Lady Victoria hungers for excitement, but how can she find it while cloistered in her cousin’s castle? Encouraged to journey north to pursue an adventure of her own, an abandoned lodge seems as fine a place as any to stop for rest. Ramsay is a shifter without a mate. 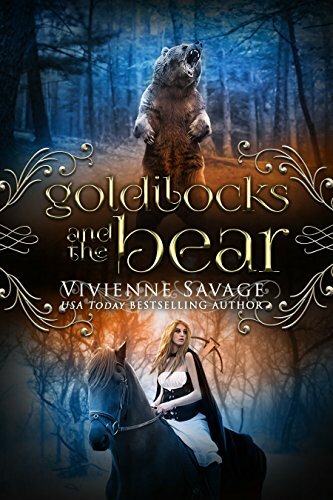 Overwhelmed by the responsibilities of becoming his clan’s new Father Bear–and the female attention that comes with that title–he leaves on holiday to enjoy the peaceful, northern hunting lodge. Finding his bed occupied by a golden-haired beauty wasn’t part of the plan, but claiming her may be. I was so disappointed in this novel. Not only are we jumped from Victoria’s status as untrained to suddenly capable, but the romance doesn’t build at all, and it’s almost as if it’s supposed to be desire at first sight. While I didn’t think they were a poor fit, there was almost no time spent on a connection developing between them, unlike the previous two books in the series. This story also had quite a bit more Aladdin in it (though with a twist) than Goldilocks. It was a good tale, but not as great as the other three I’ve previously read. I did enjoy learning more about Safiyya since I had previously read Savage’s version of Rumpelstiltskin before the beginning of this series. Vivienne Savage is a resident of a small town in rural Texas. While she isn’t writing fantasy or concocting ways for shapeshifters and humans to find their match, she raises two children and works as a nurse in a rural retirement home.